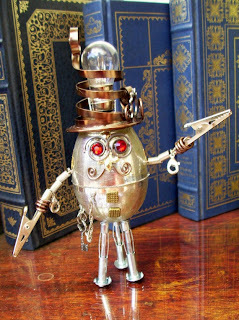 Steampunk Easter Egg by Friston. I just found this on etsy and had to share. How adorable is this little gentleman egg? This is by Friston Hookano and his shop can be found here. I can't get over his spiral hat with the light bulb! And that jaunty mustache! I can just picture him walking out from my books, exploring my desk on his way to his next adventure.